YAY!!!! I'm finally back on the Currently wagon! I've missed doing these link ups these past couple of months. This summer has been a busy one and I'm excited to hopefully get back into the swing of things and get back to blogging more. Listening to Jason Mraz on Pandora. LOVING Pandora!!! Loving my girl time. My hubby took my boys camping and so right now I am having a Shutterfly night with my friends. 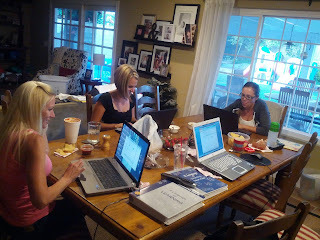 While my friends are working on their photo books, I am working on my next TPT unit... which is sickly relaxing for me. :) My computer is the one with the huge binders next to them.. Thinking of work tomorrow. I am one of the Thinking Maps trainers for my school and am presenting it to to my staff tomorrow. I love Thinking Maps and all that you can do with them! Anybody else do Thinking Maps??? Wanting a haircut. I NEED a haircut!!! My hair is long... but getting scraggly. I'm long overdue for a trim. Needing to finish my classroom. We begin school next week and I'm still finishing up my class. There is still SO much that I want to do. 1. I LOVE my 31 bag! It holds EVERYTHING!! If you've never been to a 31 bag party, you gotta go and check out these bags. I'm really not a bag party type of gal, but I really love and believe in these bags. 2. Bright Classroom Decor - I've had the same classroom decor for years now and it's time to switch it up. I've seen so many REALLY cute bright classroom decor on TPT and I'm super excited to make over my classroom. 3. I've been downloading many things from TPT and printing them. I just realized that I put copier... but I really meant printer. I've seen some teachers printing and laminating things on their own. I am SO thankful that our school provides this for the teachers. Your blog is too cute! I have been following you on instagram, but some how hadn't linked up to your blog. So I am so glad I saw you on this linky! I am with you on the hair cut- that was on my currently also. I don't know how I left my teacher bag off my list of b2s must haves. I have thought about getting a 31 bag for the last couple of years, but I always talk myself out of it at the last minute. I might have to order one this time. Thank you for stopping by Katie. I love that you follow me on instagram. Isn't it fun??? A good B2s bag is a must to carry all of our stuff. I think that you will be happy with the 31 bags and find them useful. :) Good luck with the school year. I knooooow!! !I cannot believe that I start so soon. It's nice getting out at the end of May but going back to school in the August heat in Southern CA is a crime! lol. Thank you for following me. I will be sure to check out your blog, too. What grade do you teach? Yes, teacher bags are a MUST! I shove so many things in my 31 bag and it still holds up! LOL. Thank you for visiting my blog. Thanks for sharing! I found you on the August Currently! I haven't heard of a 31 bag... I will have to look into it. I also need a haircut. I love that "girl time" photo. I use to go to scrapbooking parties with friends in my late 20's. It was always fun! Now I go to game night, but I go with my Mom's friends. Maybe I need a girls group like yours! LOL. Reading all these teachers planning for work makes me happy I still have August, but sad because I am job hunting. Good luck with back to school! I used to go to scrapbooking conventions... SO fun! I love game nights and seriously don't so them enough. I think it's time to plan some. Thanks for stopping by friend. Good luck job hunting!